Hey folks! The Three Speed Adventure April Challenge is STILL going on! One of the challenges is a Bike Overnight. 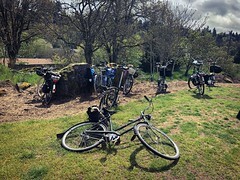 And Maria, aka, Bike Kitty is going to organize a Three Speed Campout! Do you like riding bikes? How about bikes with less than a jillion speeds? 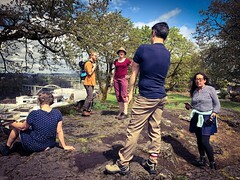 I’m organizing a group camping trip to Oxbow Park the weekend of April 28-29 and invite you to come along. This will be a Society of Three Speeds ride, so it’d be grand if you can ride a 3 speed bicycle. However, I want to have a nice sized group of fun-lovin bike campers, so bring whatever bike you have! 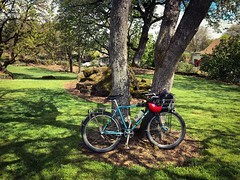 We’ll meet at Cafe Delerium in Gresham at 2pm on Saturday, April 28th, then ride about 8 miles to the park. The cafe is a mere hop, skip and jump from the end of the line Cleveland MAX stop in Gresham. Are you interested? Please drop me a note to bicyclekitty@gmail.com. If there’s no interest, we won’t go! PLEASE NOTE: Maria is the sole organizer of this campout, and I will not be able to go. So if you have questions about it, PLEASE DO NOT COMMENT HERE or ask me questions. Please get in touch with Maria via her email address above. And if you cannot make this trip, do not fear! We have one scheduled for Stub Stewart on June 2-3. I should have registration up by the end of the month. If you are interested, please get in touch!